The Baseball Alberta AGM & Convention that was held on November 17, 2018 in Edmonton, AB and was host to a new format this year. Innovative breakout sessions were added to allow various topics surrounding baseball in Alberta, one of the main breakout sessions "You Wish You Could Throw Like A Girl" was hosted by Tara Sliwkanich (Girls/Women's Baseball Program Director) and Chris James (Girls/Women's Baseball Technical Coordinator). During this session they looked at the growing popularity of the sport in our province and the opportunities for female athletes from grassroots programming to high performance athletes. 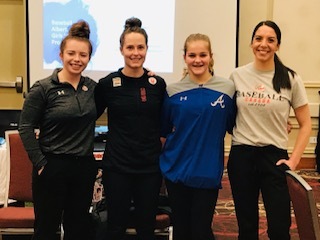 They were joined by Provincial & National Team members Nicole Luchanski and Maddison Willan who were able to share there experiences of growing up playing baseball with both male and female teammates and how the Baseball Alberta Girls/Women's program has helped them with their development. Player transfers are not required for female players who want to play on an all-female team at their age category in another Member Association if an all-female team is not available in their Home Association.